Bill Quigley, a lawyer for the Occupy protesters, said he believes it is the first case to date in which a judge has allowed an Occupy protest to take up residence again after an eviction by the city. Davida Finger, another Occupy lawyer, said that the decision proved that "No one is above the law, even the city of New Orleans." Protesters specifically identified two properties and successfully urged buyers not to purchase them. The Fight Back Center, a long-time community center in the St. Bernard neighborhood in New Orleans’ 7th ward was slated to be auctioned at today’s sale despite city personnel having acknowledged that there were numerous legal problems with the process. “This is community space and we will fight to keep it that way,” protesters declared. The Fight Back Center is currently being redeveloped and rebuilt by Survivors Village, which began in 2006 as a tent city of public housing residents who were locked out of their homes after Hurricane Katrina. Protesters also urged buyers not to purchase the home of an individual who had approached them to express thanks for what they were doing. The individual’s home had been completely renovated, but the city refused his offer to pay the $575 fine that had been assessed, refusing to waive the thousands of dollars in fines that accrued daily since the home was declared blighted. He was financially unable to pay these fees and thus faced loss of his home. Following the protesters’ declared intention to defend these properties, neither received a minimum bid and thus remained unsold. 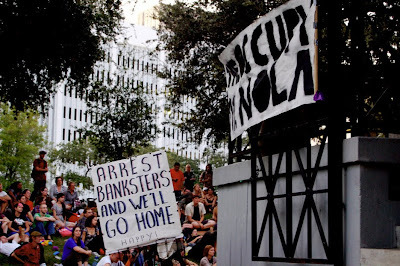 The protesters’ disruption at the Sheriff’s sale occurred less than eight hours after Occupy NOLA was itself evicted from their encampment at Duncan Plaza. 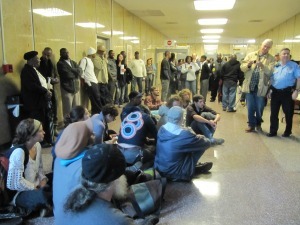 Around 4 pm, Occupy NOLA was issued a temporary restraining order by US District Judge Jay Zainey who said he was "not happy" that the city opted to clear the camp while a motion for a TRO was pending. Today’s protest was also carried out in solidarity with a call from Occupy Wall Street, who declared December 6 a day of action on the foreclosure crisis. View a video of today’s protest at this link.